At this point, April Fool’s Day is much more annoying than amusing. “Hilarious” hijinks abound, and are they really funny? Or do they just bring heartache to the duped? It’s April 3, and we are officially over it. Real funny, “D-Rok.” After his post was shared about 2,000 times, the cruel truth was revealed: The photo was actually from a false April 1, 2017 story about In-N-Out coming to McAllen, Texas (note that date again). Nguyen apologized, but once again for the people in the back: The internet is forever, and apologies after the fact are like shutting the barn door behind the escaped horse. According to The Wichita Star, he saw the photo on Facebook and “On an impulse, he shared it and decided he could really fool people if he said it was happening at Greenwich Place, where lots of construction is going on anyway. 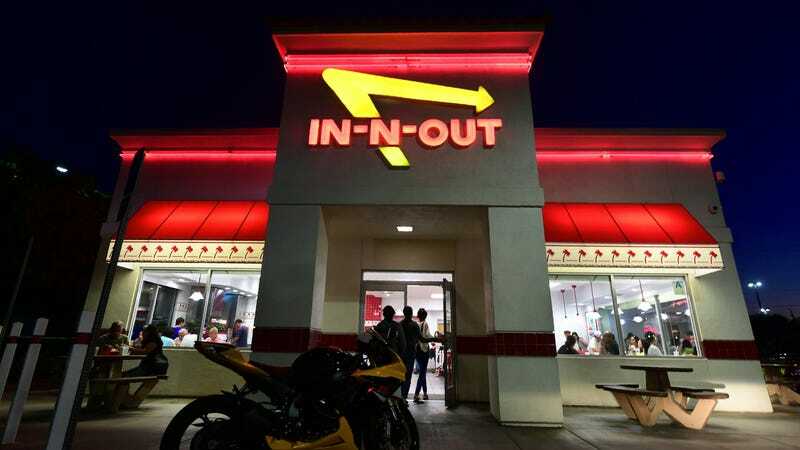 He was surprised how many people fell for it… ‘I didn’t see that coming at all… It was just for friends.’” Previous fake In-N-Out announcements have occurred when some jokers hung a “coming soon” sign up in Porterville, California, as well as a false promise of a Tulsa In-N-Out. For the record, current owner Lynsi Snyder has said that the chain will not expand east of Texas in her lifetime. In conclusion, words to live by: Never purchase gas station sushi. Never ask a woman if she is pregnant. Never believe anything you see/hear/read during the first week of April. And never believe an In-N-Out burger is coming to your town until you are holding a Double-Double in your hot little hands.